Arashi Raishi II held the name of Arashi Sangorō III from the 11th lunar month of 1797 to the 1st lunar month of 1823. 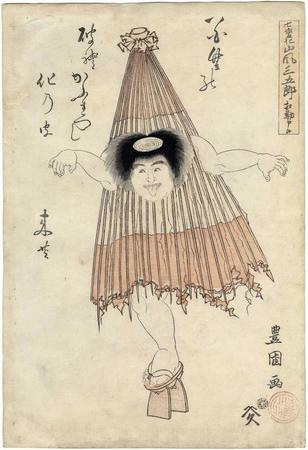 Kasa-obake (Japanese: 傘おばけ) are mythical ghosts (yōkai 妖怪) in Japanese folklore. They are sometimes, but not always, considered tsukumogami (付喪神), a tool which becomes imbued with living spirit after long use. They are also called "karakasa-obake" (から傘おばけ), "kasa-bake" (傘化け), and "karakasa kozō" (唐傘小僧).